A man who sang in the face of a black colleague while dressed up as a black and white minstrel during a works Christmas party has been convicted of racially aggravated behaviour. Brian Davies caused the woman alarm, distress and offence by "blacking up" his face and performing, magistrates in Cardiff ruled. 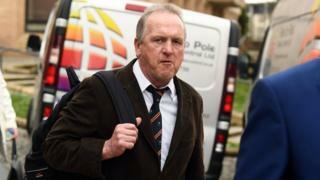 Davies, 62, of Barry, had denied causing racially aggravated harassment, alarm or distress during a trial. During the trial Robert Reid, prosecuting, said Davies had depicted a character from the Black and White Minstrel Show. Catering manager Loretta Dayley was "singled out" when Davies directed the black and white minstrel song "Mammy" at her at the Coopers Carvery in Cardiff, the court heard. Mr Reid said Davies had insisted Ms Dayley attend the event for employees of the Priory Group on 19 December 2018, telling her he had bought her a present after she initially showed reluctance to go. Mr Reid said: "At the Christmas outing he retired briefly before returning, dressed as a black and white minstrel from a television show, and he sang a number of lines from that show, paying attention to Ms Dayley." Footage of the incident was played in court, showing Davies with his face blackened and wearing a boater hat, a white shirt, and swinging around a cane while singing at Ms Dayley, who is initially seen laughing along with her colleagues. But Mr Reid said the incident had left Ms Dayley "distressed", saying she had been off work and was receiving medication. She told the court via video-link how she felt "humiliated" during the stunt. In Davies' defence, he referred to her as "a dear friend" who he always got on with. "I never thought of Jackie as a black person or any different to the rest of us," he said. The idea for the outfit came from discussions about old television shows with the Black and White Minstrel Show mentioned, Davies added. He said: "I'm not saying she used to like it but that she just used to watch it." The defendant said "it never crossed my mind" when asked if he thought it was racist and he added: "I thought she was laughing to start with. I didn't know she was upset by it." He said when he found out Ms Dayley had been offended, he was "devastated" and tried to apologise. Magistrates did not decide on a second charge of using threatening or abusive words or behaviour or disorderly behaviour.